TRIVIA of Noh : Q67 : What does "komi" mean in the Noh world? | Home | Trivia | Q67 : What does "komi" mean in the Noh world? 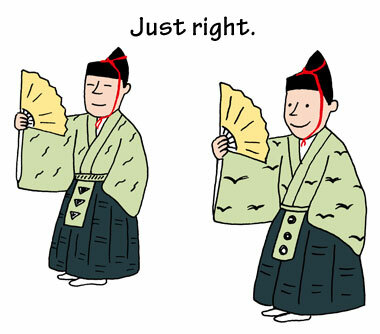 What does "komi" mean in the Noh world? You hear various kinds of sound from the Noh stage, including monologues and dialogues from leading and supporting actors, as well as chants and music. During periods of quiet, the rustling of costumes and tabi socks also conveys something to the audience. Meanwhile, as well as the sounds on stage, there is an expressive element, called komi. This is a special Noh word that describes a silent interval of concentration between actions or musical parts. The term "komi-wo-toru" (take a komi) is used to describe taking a brief interval to concentrate on the next action. For the performer, komi is an action to concentrate on the performance. The level of concentration is sometimes described as asai (shallow) or fukai (deep). For the performance as a whole, komi is an important element that allows performers to be conscious of each other, so that without watching the others they can start the performance simultaneously and keep pace with the tempo. For example, when a leading actor beats time with the feet, he stamps once and takes a komi and the musicians also take a komi. Then, the foot stamps and the sound rings out. For the audience, being aware of komi allows them share the ideas and the understanding of the performers on the stage. Paying attention to silence filled with the performers' concentration, as well as the sounds from the stage, brings the audience closer to a profound appreciation.